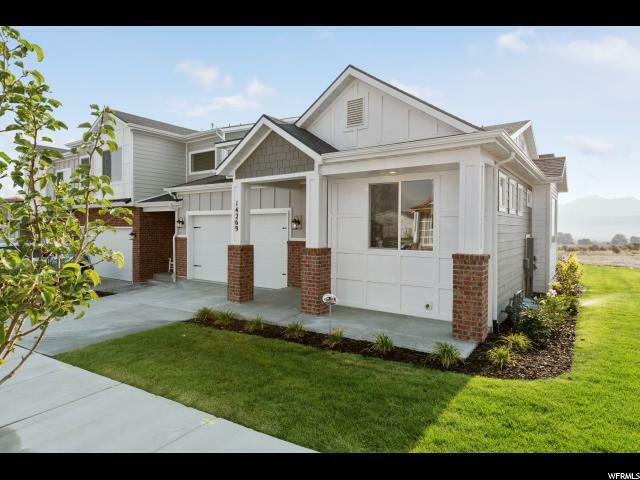 All BELLA VEA homes currently listed for sale in Herriman as of 04/22/2019 are shown below. You can change the search criteria at any time by pressing the 'Change Search' button below. "Rarely available end unit rambler home in a maintenance free community of LUXURY Bella Vea Townhomes. Haven't considered living in a townhome before? These homes have limited shared walls and are 2x6 construction with a 3/4 air gap and 2 of firewall, over 13 between walls. Sound proof! Built by a custom home builder the finishes are nothing you have seen in a townhome before. 9 ft ceilings, 8ft doors, hardwood floors, custom built and designed cabinets, soft close drawers, level 4 granite counter tops, Gallery appliances, 7ft euro shower with dual heads, 2 laundry rooms, huge finished basement with a wet bar...the list goes on and on. You must do yourself a favor and check these homes out. Community pool, spa, restrooms, showers and pickle ball court will start construction this year. HOA covers all exterior maintenance, insurance, water, yard care, and sidewalks and driveway snow removal. Model homes open Monday to Saturday and available by appt any day. This home will be ready in June finishes and colors are the same as the photos. " "Are you looking for a beautiful, low maintenance home? Then come take a look at Bella Vea Luxury Townhomes. Not sure about a townhome you say? Or even if you are looking for a townhome we've solved for many of the concerns of a potential owner. First, we soundproof between every home. That's right. No hearing your neighbors. Second, huge rooms and windows. Our residents say they completely forget they are in a townhome. Third, two air conditioners and two furnaces. Want your bedroom cool during the summer without freezing your basement? We have you covered. Finally, we include a finished basement with 9 ft ceilings so it feels like a place you really want to spend time in. Bella Vea is Pet friendly and you can fence your yards. Yard sizes average 15 to 20 feet deep and 30 to 38 feet wide. All of this is in addition to standard finishes like quartz countertops, hardwood floors, energy efficient insulation, and a huge master walk in shower. Come take a look. We think you'll like what you see. "